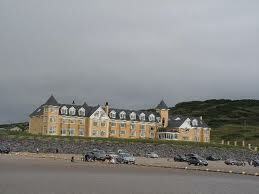 FAMOUS DONEGAL HOTEL SOLD FOR RESERVE PRICE OF €650,000 – TO ITS MANAGER! By Darren Boyle in Dublin: The famous Sandhouse Hotel in Rossnowlagh has been sold for the reserve price of €650,000 today as a distressed property. The hotel, in which former British Prime Minister Tony Blair spent many summer holidays, was sold to current manager Paul Diver when it went under the auctioneer’s hammer at the Shelbourne Hotel. The bidding, which opened at €600,000, lasted just a few seconds before Mr Diver snapped it up. There were a couple of bids on the hotel before it closed at €650,000. The hotel has been owned by the local Britton family for more than 50 years and had a number of VIP guests over the years including Woody Allen and then wife Mia Farrow.